I am terrible at Mario Kart. Though I’ve played them all, starting with the series introduction on the SNES, I never really seem to get any better at it. I’ve tried, mind you. I play the game regularly with my family, and regularly I get beaten by my boastful children. In all these years, my skills have essentially remained static, barely changing at all. The same could be reasonably argued for Mario Kart itself. The prevailing argument, for those who aren’t dedicated fans of the cutesy kart racer is that if you’ve played one, you’ve played them all. 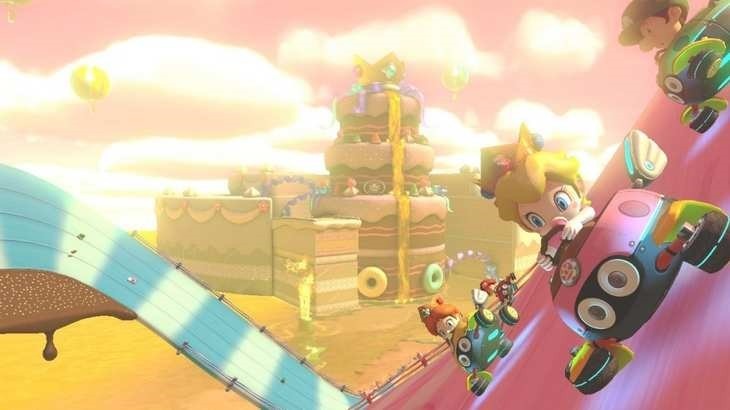 Aside from one notable exception, each game has done little more than add embellishments, iterating upon the last and that’s indeed true for Mario Kart 8. You select one of a multitude of characters from the Mushroom Kingdom and beyond, then compete against AI to win various cups across three levels: 50cc, 100cc and 150cc – each increasing in speed and difficulty. Your goal naturally, is to win – using whatever means necessary. Those means, if you’re as skilled at Mario Kart as I am, usually means dastardly weapons. Whether you’re hurling old stalwarts like the green and red homing shells of dead Koopa Troopas, flinging fireballs or leaving behind slipper banana peels, there’s almost always some sort of armament aiding you and keeping things exciting. There are a couple of new ones this time around. The boomerang works exactly as you’d imagine; throw it and if it doesn’t hit your target the first time, it may do so upon its return to your hand, whence you may hurl it a second a time. There’s also a potted piranha plant that gobbles up everything in its proximity and a new horn that emits a a wave of sound that obliterates anything in its oscillations. Yes, even that frustrating blue shell that’s the cause of ceased friendships. Finally, Mario Kart 7’s Lucky 7, which gave you 7 power ups to use in rapid succession has been upped to 8, giving you a swirling arsenal of offensive and defensive power. It’s far more balanced than Mario Kart’s last console outing on the Wii which had overpowered bikes, but those vehicles are back. Skill is the main decider of the victor here, though with this being Mario Kart it’s still probable that you’ll be hit with a blue shell or made diminutive by a bolt of lightning just moments before your cross the finish line. 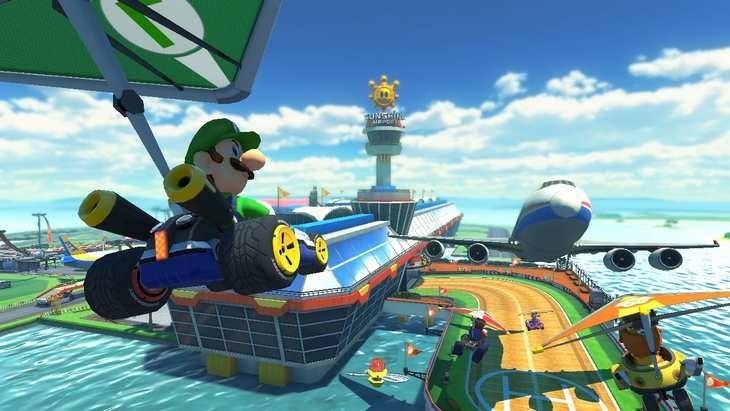 As usual, Mario Kart gives players in the rear access to stronger weapons and faster power ups – while giving the race leader a selection of weaker ones. As with Mario Kart 7, as you race you’ll collect coins. You’ll use them to to customise your Kart; collect 50 and a new bit of gear in one of three categories is unlocked; chassis, tyres and hang-glider. They’re not just cosmetic either; experimenting with the correct, balanced builds can be the difference between winning and in my case most of the time… not winning. The big new addition in this iteration comes through anti-gravity sections, joining Mario Kart 7’s hang-gliding and under-water racing. Go over any of the specially marked blue pads and your vehicle’s wheels fold in, allowing it to hover over bits of the track, adding a strange sort of verticality and allowing the track designers to get slightly unhinged. Bumping in to an opponent while hovering actually adds a speed boost, changing up the racing’s strategy a bit. It’s neat, but not creatively used nearly as much as you’d expect. That’s not to say the tracks aren’t great. 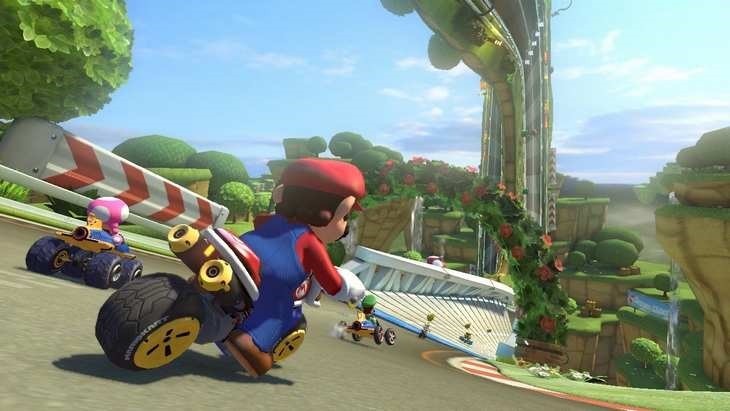 As is expected of a Mario Kart game, you have 16 brand new ones and another 16 repurposed from Mario Karts. 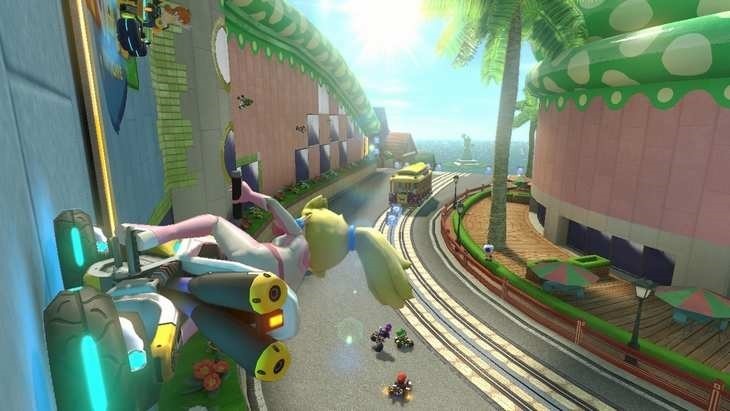 The new tracks are all exceptionally well designed, filled with the little short-cuts and secrets that make Mario Kart such a blast to play. Even the old ones have been expertly retooled to fit in the new mechanics, with favourites like the Wii’s Moo moo Meadows and the 3DS’ Retro Studios designed Donkey Kong Jungle shining particularly bright. Each track is a delight – even Rainbow Road – and the change from 8 players to 12 gives the core racing the shot in the arm it needs. The 12 player extends to online, and Nintendo seems to finally be realising what it is that people want and expect out of online functionality. You can play with random people from the internet, people from within your region or people on your friend’s list, though it promises voice chat that doesnt really work. The system also allows for the easy creation and curation of tournaments, all of which will certainly keep people playing the game for ages. You can even have two people playing online at the same time from one console, and there’s isn’t a friend code in sight. A new feature, called MKTV, allows you to create and edit your own videos, creating highlight reels of your races and upload them not only to the MKTV service, but also directly to YouTube. It’s not what I’d call a robust editor at all, allowing you to change just the driver and actions it focuses on and its length, ranging from 30 seconds to a minute, but it works and helps show off just how gorgeous the game is. It’s a tremendous amount of fun really – but it’s not all good. The package as a whole is a little bare, offering the standard 4 race Grand Prix, Time trials, customisable VS races and the balloon-popping battles that have become standard. The battles have taken a step backwards. Instead of the battle-specific arenas that would funnel players towards each other, battles now take place in stripped down versions of a selection of the game’s race tracks, so it’s become a case of racing around until you manage to see somebody long enough to hit them with something. The Gamepad isn’t used particularly cleverly here either. Unlike Sonic and All-Stars Racing Transformed which allowed you to use the pad a a screen for a second player while the first concentrated on the TV, both players have to share a a vertically split screen. Sonic even allowed a fifth player to join in the action on the Gamepad, with 4 players split on the main screen. In single player, you could use the pad as a rear-view mirror. None of that is present here, with the pad function only as a map or a duplicate display. I understand why Nintendo’s done this; it’s probably to keep the frame rate up, but it’s disappointing nonetheless. The option to use the Gamepad’s gyro to steer is there, but the thing is too unwieldy for long use. The preferred option is Nintendo’s excellent Pro Controller, though motion-steering with the Wii remotes works just fine. The frame rate also drops significantly when more than 2 players start racing. Instead of that smooth 60fps, it drops to half that, with a noticeable image quality drop – but there’s so much going on on-screen that’s it’s forgiveable, and doesn’t detract from the experience much. 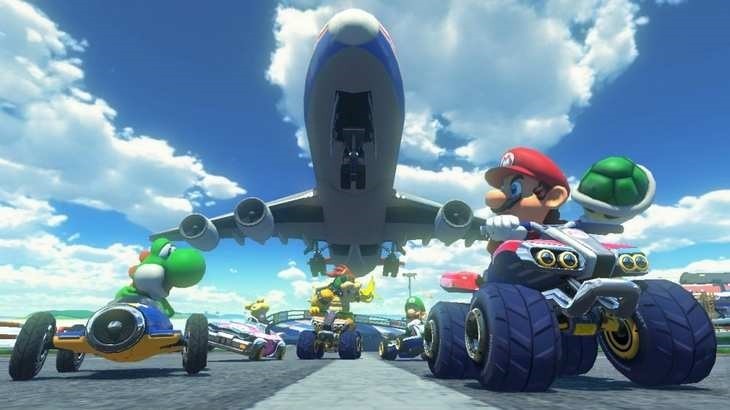 Minor complaints aside, I’m pretty sure I’ll be playing Mario Kart 8 for a long time, and it belongs in every Wii U owner’s library – whether they be established Mario Kart fans or not. What it lacks in raw innovation it more than makes up for in pure joy. 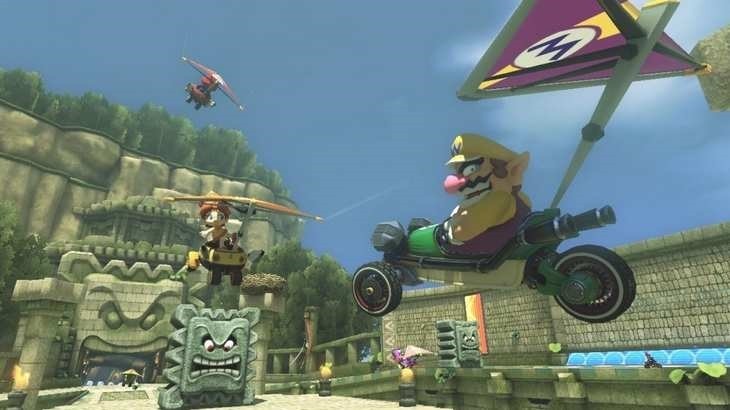 Mario Kart 8's bare-bones presentation is offset by its solid core racing, and is an essential purchase for every Wii U owner who appreciates fun.